Literary essays by novelists are rarely worth reading. Coetzee, like Woolf and Kundera, is an exception. Inner Workings is compiled from five introductions by Coetzee to contemporary editions of works by Graham Greene, Arthur Miller, Robert Musil, Samuel Beckett and Hugo Claus, together with 15 essays for The New York Review of Books. Two-thirds of the book deals with the literary achievement of the generation of cultured Jewish writers that emerged from the wreckage of the House of Hapsburg (with Walser, Musil and Celan my high-points). The last third is primarily post Second World War British and American writers, and a few contemporaries. Unlike some novelist-turned-critics, Martin Amis leaps to mind, Coetzee’s reviews are courteous and balanced, no histrionic name calling, but with the wit to place a writer firmly under scrutiny. I mostly concur with his implication that Walter Benjamin was a political poseur who frequently reached beyond his ability to sustain a project, but I cannot claim any deep reading of Benjamin. To add depth to his criticism, Coetzee provides historical context. As an adept in the English, Afrikaans, Dutch and German languages he is also uniquely able to comment on the translators’ craft. Although praising Michael Hofmann for the expression, poise and precision of his English, he has concerns about his translations of Joseph Roth. A rewarding set of essays from one of the major writers of our day – I’ve already ordered the set of essays that precedes this collection. This entry was posted in Arthur Miller, Graham Greene, Hugo Claus, JM Coetzee, Martin Amis, Michael Hofmann, Milan Kundera, Paul Celan, Robert Musil, Robert Walser, Samuel Beckett, Virginia Woolf, Walter Benjamin by Anthony. Bookmark the permalink. i was wondering, what is it you don’t like about benjamin? i find myself — over the years — coming to always different conclusions about him, sometimes i think he is spot on and at other times i can’t find myself to agree with him at all. and over the years he is a writer i come back to ever so often to read him again. and in disagreement with some statements of his there is still somehing in him that absolutely makes me to appreciate the effort he put into thinking about something, and he wrote a wonderful german. which texts of benjamin made you agree to coetzee’s verdict of him being a poseur of modest talents? I confess to being conflicted about Benjamin, and not completely able to separate the man from his writing. Much of his work is insightful, occasionally brilliant (his essays on Proust and Kafka). His political stance, given the knowledge that he did not read Marx until toward the end of his life, in particular his late support of Stalin (well after genocide was evident), justifies the label of poseur. Balancing the brilliance of some of his essays is the intellectually bankrupt ‘Arcades Project’: ten years of effort for what? Sontag suggests that his shorter pieces are his most successful, that he struggled to sustain an argument in lengthier texts. You’ve give me cause to consider both my reading of Coetzee and my limited capacity to be judgmental about Benjamin. 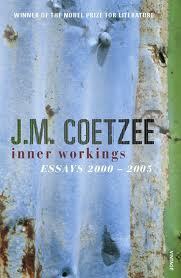 As to Coetzee’s essay, now read thrice, my original interpretation overstated the degree of his fault-finding. Consequently I have changed the sentence in my post. I need to read more of Benjamin’s work, I am forming an opinion of his talents based on a small (but important) part of a vast body of work. My opinion that he was a political poseur still stands. and i don’t think the complete works of coetzee could stand up to the depth and divergence and range of benjamin’s complete works… so in this sense, if you wanted to, you could just as well turn the poseur verdict around….but this of course wouldn’t help to gain any further insight into either coetzee or benjamin…. I agree with all you have said. It is clear from Coetzee’s essay that his own reading of Benjamin is deep. The man and his work are, to a greater extent, separate entities, and I do not dismiss his work. I shall continue my own reading of Benjamin. There is much there that is highly insightful.